Great Lakes Radio Consortium’s David Hammond examines his own backyard. That’s when the men of my neighborhood head outside for their weekly call to arms. It’s yard day. mowing, edging, and weeding. It’s a procession that lasts all weekend. strips across the yard. Stop the mower. Take the grass bag and dump it into the compost bag. bagging is better environmentally, but I can’t back it up with facts. So I decide to investigate. here, his word carries weight. Unfortunately for me, he recommends bagging. He also says bagging makes a yard look better… usually as he’s looking at my yard. grass clippings, but as I looked down my street at all the 30-gallon bags waiting to be picked up, I wondered where all that waste was going. happens, it gets sent to the landfill. process the yard waste, but the program employs a dozen local people. I had to give it thumbs up. more pool. No more picnics. No more Sea Breezes at high tea. No, what I saw was a sweat-stained, fat guy lugging 30-gallon compost bags to the curb. That was going to be my summer. Hell, it was going to be the rest of my summers. you mulched them well when you cut them. Laura Rubin is the Executive Director. “Community-wide composting programs are great and if you have a good one, you can’t go wrong. So in the great bagging debate, it seems that both sides can claim the environmental high ground. all those bags to the curb, I’ll tip a glass to you. For the Great Lakes Radio Consortium, I’m David Hammond. New Lakeshore Wetlands: Nuisance or Asset? 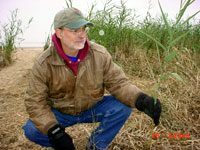 Terry Miller, of the Lone Tree Council, is one of the few Bay City residents trying to protect wetlands sprouting up along the beaches of Saginaw Bay. Many of his neighbors prefer beaches with less vegetation. Photo by Steve Meador. wind blows off the bay toward Bay City State Park. decades, thin bands of emergent wetlands now flourish along the shores of Saginaw Bay. erosion by anchoring shoreline sediment during storms. 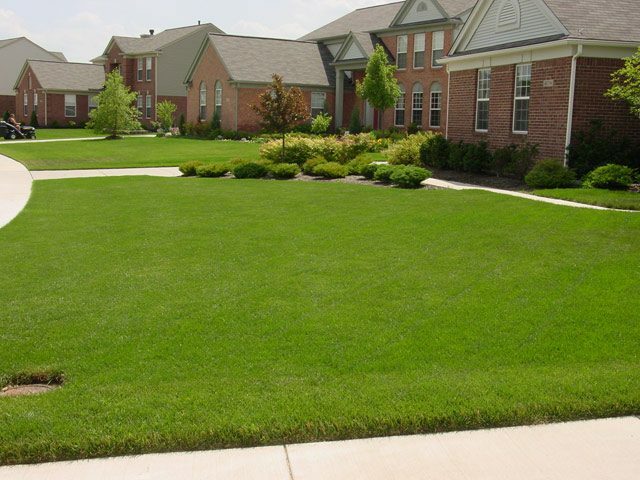 they are with clean, sandy beaches or an unobstructed view of Saginaw Bay. sandy beaches, like the one at Bay City State Park. wildlife is in the nearby Tobico Marsh, away from park users. property rights group called Save Our Shoreline, or SOS, that Krygier heads up. Thomas M. Cooley School of Law in Lansing. He’s had some experience in this area. Resources for more than 15 years. no right to destroy vegetation on public land. For the Great Lakes Radio Consortium, I’m Steve Meador. In a narrow swath of grass in a roadside ditch, a mallard hen nests her second brood of the season, a rare event for these ducks. Her first ducklings were killed by a predator. Researchers Tina Yerkes and John Simpson track the mallard hens by radio transmitters. They've found many of the ducks are killed by agricultural pursuits such as mowing. 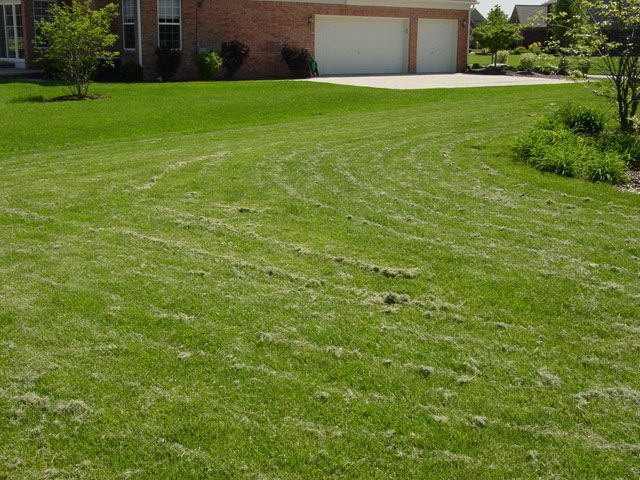 Lawnmowers can kill hens that are nesting in grass. John Simpson 'candles' an egg, looking at the silhouette of the developing duckling to see how near it is to hatching. In the last decade of so, ducks in the Great Lakes region have not been reproducing as well as they have in the past. The number of ducklings hatching out and surviving to adults has dropped by about twenty-five percent. Researchers are trying to figure out why this is happening, and what can be done about it. The Great Lakes Radio Consortium’s Lester Graham went into the field with researchers and has this report. Mallard ducks are the most common duck found throughout the Great Lakes states. You’ll see them on farm ponds, college lagoons, and even in big city parks. But recently the mallard’s population hasn’t been growing as fast. The duck’s rate of reproduction has been falling off in the region since the mid-1980’s. Researchers with the sportsman’s conservation group, Ducks Unlimited, are involved in a three year study of mallards to find out why the ducks are not surviving in as great of numbers. Tina Yerkes heads up the project. 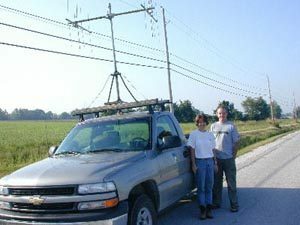 In a truck with something that looks like a TV antenna on top, fellow researcher John Simpson and she are in northwest Ohio, near Lake Erie, headed out to find some of the mallard hens. Tiny transmitters were surgically implanted in the ducks earlier this year and the antenna tracks the signals. “So, this is the whole gizmo setup here. Everyday these guys go out and they track the birds. Each bird has a unique beep, if you will, uhm, a frequency. And that’s basically how we figure out what they’re doing. We started with 57 and you’re down to 38? As the truck gets close to the last sighting of one of the mallard hens they’re tracking. John Simpson flips on the tracker and turns the antenna. He’s pulled over along a fairly busy road, and starts looking around in the roadside grass. It’s hard to believe a duck could find a place for a nest here. Most of the roadside is mowed except for a little strip of grass where we’re looking. She’s one lucky duck. A mower would kill her and destroy her nest. Simpson has to flush her so that he can take a look at the eggs in the nest. The duck lost her first brood to a predator. Since she had nested close to a subdivision, it could have been a dog or cat. But the researchers say in this case it was probably a wild predator, maybe a raccoon. It’s very rare that a mallard hen tries twice to raise a brood, But in this area the ducks are adopting a lot of unusual behaviors. Since there’s almost no grassland to nest in, hens have nested in hay fields where they’re usually killed at mowing time. One hen made a nest in a large flowerpot. At our next stop we found a duck in the backyard of a mobile home, and her eggs had just hatched. The owner mowed around the duck’s nest, giving the mother and her eggs a chance to survive. Now that they’ve hatched, they’ll head to the water nearby. Tina Yerkes says development pressures have hurt the ducks here. The Ducks Unlimited researchers are getting some indications about what kinds of things are hurting the ducks ability to reproduce. 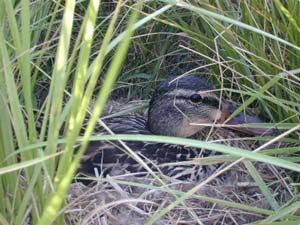 Besides the loss of wetlands the researchers are finding that farming practices such as frequently mowing ditches and urban sprawl taking up grasslands are all contributing to a high mortality rate among ducklings and sitting hens. But the researchers haven’t collected enough information yet to make any solid conclusions. It’ll be two more years and many more sites before the Ducks Unlimited researchers have enough hard data. Robert Payne is the Curator of Birds at the University of Michigan Museum of Zoology. He says while to researchers it might seem pretty clear that people are causing the lower rates of production in the duck population. Information like the Ducks Unlimited group is gathering will be helpful. But some people might find data that are supposed to help ducks gathered by a group that’s chiefly supported by people who kill ducks for sport might be a bit of a conflict, or at least very self-serving. Ducks Unlimited researcher Tina Yerkes says there’s a larger purpose here than merely making hunters happy. Predictions are that the human population around the Great Lakes will steadily increase for the foreseeable future, and if the researchers’ early indications hold, it’ll likely affect the duck population even more. This study, when it’s complete, might give policy makers the information they need to find a balance between the needs of people and the needs of wildlife as the conflict between the two grows in the Great Lakes region. The sportsmen’s conservation group, Ducks Unlimited is involved in a three year study, trying to learn why mallard duck populations are not increasing in the same numbers they once were. Tina Yerkes is a research biologist with the organization. She says starting in the mid-1950’s mallard flocks were growing at a pretty rapid rate. 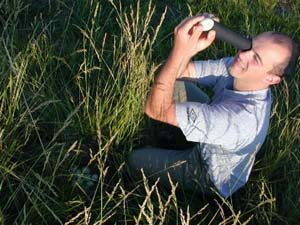 Yerkes and a team of biologists in Michigan, Wisconsin, and Ohio are tracking mallard hens and their broods. Early indications are that loss of habitat is beginning to affect the duck populations in the region. For the Great Lakes Radio Consortium, this is Lester Graham.